Taken apart into atoms, bits of its metal have yielded an isotopic census of its component elements. This geochemical equivalent of a DNA ‘ fingerprint ‘ reveals where much of the two tons of bell metal originated, for each mining district has a unique isotopic signature. The conclusion is clear-- the bell was not cast from virgin metal, which in colonial Philadelphia might mean pigs of Bristol copper and Cornish tin. Mass spectrometry tells instead that the bell’s metal is a farrago, a burgoo, a blend of old coins and cannons and candlesticks, and above all, other bells, recycling being the great secrets of the founding founder’s art. After a century of hard use, even the soundest bells may crack, as old Liberty indeed did. Throughout history, the bells hardest rung have been the first to return to the melting pot. To give birth to Liberty, some few old ship and church bells had to perish in 1751. Into the fiery furnace they went, to be leavened with bronze scrap ranging from worn-out King George cartwheel pennies, to burst bronze cannons, bent barber’s bowl’s dinged baptismal basins and such lesser vessels as chamber pots and ale cans dented past repair by a tinker’s dam. Along with tin traceable to Sir Walter Raleigh’s term as Warden Of The Stanneries , the great bell cast in 1751 represents copper sheathing from stranded British Men O’War, lead European cathedral roofs, Persian and Andalusian brass, a pinch of debased Roman silver, a dash of Byzantine and African gold, and enough arsenic of unknown origin -- having just one isotope, there's no telling whence the toxic stuff was mined -- to assure that the EPA will forever keep the Liberty Bell from being turned into souvenir spoons and shot glasses. Many historic bells have faced worse indignities . One of Stalin’s first acts on coming to power was to silence the loudest Christian voice in Moscow. Down came the 13th century Danilov Monastery's whole 33 ton carillon , including the nine-foot Bolshoi bell, a 26,000 pound 19th century monster revered for its special ‘diction’ -- bright and high overtones with velvety ’ Mother Earth” low ones are rare in bells of such massive weight. Wreathed around its nine yard circumference in Old Church Slavonic is the dedication: “Father Archimandrite Iona and the donation of merchant’s wife Anastasia Sergeevna Zakharova for the repose of her late lamented husband Ioann, a servant of God.” The two other leading bells are the Polieny, which weighs 365 poods (about 6 tons if you must know), and the Weekday , marked 131 poods : 1790. They were saved from the melting pot by Charles R. Crane, an American diplomat of independent means who bought them for his alma mater. Installed in the tower of Lowell House four generations ago, they rang through war and peace, awakening Harvard each Sunday, at the decorous hour of 1 PM, with changes rung by a self-propagating society of hardy, if somewhat deaf, Lowell House klappermeisters. The story of the bells' migration dates to 1929, when Crane learned Harvard planned a 214 foot clock tower atop it newest and largest undergraduate residence, the masterpiece of Silent Cal’s architect cousin, Charles Allerton Coolidge. Crane reasoned correctly that President Lowell would have to be bats not to convert it to a belfry, if presented with a whole carillon of clarion bronze, for Lowell had a deep interest in bells, his library of rare books including De Tintinnabulis by 16th century Master Caster Hieronymus Magius. Crane, who served President Wilson at the Versailles Conference, was appointed the US minister to China, but resigned his post on Harding’s election and set out to journey home by private car via the Trans-Siberian Railway. Passing through Harbin, he chanced on his friend, the Byzantine archaeologist Thomas Whittemore, and traversing the steppes, was moved by the mysterious and compelling sounds of the Russian bells heard as his train passed through Rostov in the night. Later that year, with Crane’s backing, Whittemore founded “The Committee for the Education of Russian Youth in Exile in Europe,” a program to assist White Russian йmigrйs, one of whom later told him that the Danilov bells faced extinction. In May 1930, the Byzantinist cabled The Soviet Union Combine for Export and Import of Antiquaries and Art Goods (known as “Antiquariat”) from Berlin, and wired Crane’s personal affairs manager, instructing him to “Ask University transfer by cable $10,000 to Guaranty Trust Co New York.” It wasn’t Harvard’s money--Whittemore used Crane’s pseudonym “University” in his cable traffic lest the Kremlin discover the diplomat's involvement in the transaction. But his cover broke on March 9, 1931, when Time magazine got wind of the deal, and put the musical rescue mission on the cover. Besides tolling in grief, celebration , and alarm-- in my memory the loudest on the night the Berlin Wall fell, the bells of what some once presumed to style Moscow on the Charles also rang in Stolzhynetsyn’s honorary Doctorate. But they are coming down this week. After 78 years of refuge here, these iconic Russian bells will return ,one hopes permanently, to their former home --the Danilov Monastery is once again the seat of the Russian Orthodox Church . “While recognizing that the bells legally belong to Harvard, the more than 700-year-old Danilov Monastery, now the headquarters of the Russian Orthodox Church, has made formal and informal requests for their return over the past 20 years. 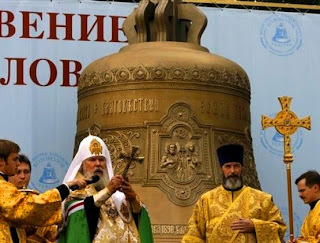 An agreement between Harvard and the church, reached in... 2003, stipulated that the Danilov Bells would be relinquished by the University in exchange for a set of replacement bells. The Link of Times Foundation, dedicated to the restoration of Russian arts and culture, has financed the replacement bells... As the project to return the bells brought a new era of cultural relations between Lowell House and the Danilov Monastery, Harvard bell ringers traveled to Russia to train, and Russian bell experts held master classes in bell ringing at Lowell House. Many of the big guns Napoleon abandoned on his retreat from Moscow ended up in the melting pot, the cannons’ roar transformed into the eternally rolling voice of a thousand Orthodox churches. But when the revolution came, back into the melting pot many of the carillons went, the Reds preferring a Russia poor in bells , but rich in bronze statues celebrating themselves. Yet what goes around comes around. Harvard’s 33 ton trade-in has given it a new set, wrought in no small part from the smelted heads of a horde of dead Bolshevik. Having once given voice to God ,the metal in which they were briefly immortalized has been melted down yet again into the very octave Stalin's Kremlin most feared to hear.